Challenge: Finding innovative ways to achieve the communities strategic plan 2013-23 objective relating to practicing sustainable living. 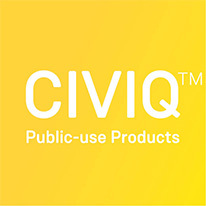 – Providing portable water refill stations at Council’s major events in key public places. Result: Taking a step closer to being a leader in Environmental Sustainability by supporting and encouraging the community to practice sustainable living by reducing plastic waste from disposable drink bottles. Shellharbour City Council is committed to being a leader in environmental sustainability. In 2013 Council decided to purchase a number of aquafil™ portable water bottle refill stations to use at major community events. The aim of the refill stations was to support the local community in practicing sustainable living, reduce waste to landfill and reduce stormwater pollution. 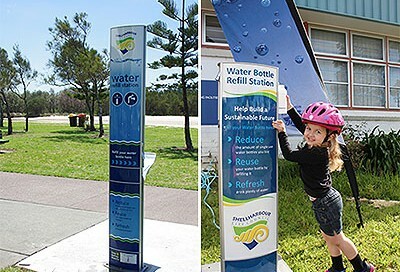 In 2012 Council took advantage of a funding opportunity from Keep Australia Beautiful through its Beverage Container Recycling Community Grants, to install a permanent aquafil™ water refill station and drinking fountain at a popular picnic area at Reddall Reserve, on the foreshore of Lake Illawarra. Both initiatives encourage the consumption of tap water, which has a much smaller ecological footprint than bottled water. These initiatives also encourage people to bring their own drink bottles and embrace the ‘refuse, reuse’ philosophy rather than the ‘throw away’ mentality. By filling up reusable water bottles, Council and the community are reducing the amount of plastic waste that ultimately ends up in landfill, water ways and oceans. The aquafil™ units come with a range of optional features and water meters were installed on both permanent and portable refill stations to calculate the ongoing environmental benefits associated with drinking tap water instead of bottled beverages. In addition to the display panels which allow for advertising on the refill station itself, Council has also purchased flags which read ‘Water Refill’ to draw attention to the units at events. “We have only recently started using our aquafil refill stations and already it’s great to see the environmental benefits accumulating as each bottle refilled at the station is potentially one less disposable beverage bottle that will be consumed. 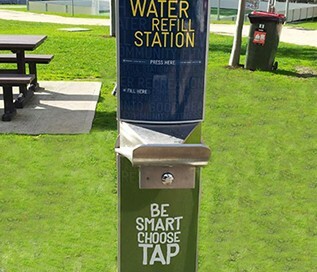 “We’ve also found children have really enjoyed the novelty of refilling their water bottles from the special refill station,” says Alison Mellor, Environment Officer Shellharbour City Council. Council has also adopted the Illawarra Regional Food Strategy which describes how Illawarra Councils can work together towards a vision for a vibrant, sustainable local food system that is resilient, prosperous, fair and secure. Making fresh drinking water available in public spaces is one of the actions identified in this strategy and the provision of water refill stations helps achieve this action. Challenge: Environmentally sustainable initiatives to help reach goal of becoming a ‘Green Star – Education v1’ enterprise. Solution: Water refill stations and drinking fountains across three Deakin campuses. Result: A sustainable initiative in the effort to achieve best practice water conservation. Working towards its goal of being a ’Green Star – Education v1’ enterprise that integrates environmental sustainability principles into all of its operations, policies and activities, Deakin University has installed aquafil™ water refill stations and drinking fountains in key locations across three campuses. This is one of several environmentally sustainable initiatives implemented by Deakin in an effort to achieve best practice water conservation, stormwater management and waste management practices, following detailed water audits that were undertaken at each campus. Detailed research around accessibility was carried out to determine which water units would be best suited to the University’s needs. aquafil™ offers a wide range of water refill stations and drinking fountains to choose from. As well as being wheelchair accessible, the units have a range of optional features, such as water meters to track usage, filtered or non-filtered options, dog bowls and display panels for advertising. ‘The units met accessibility requirements from an OHS perspective and the choice of optional extras made aquafil™ the perfect choice,’ says Amanda Neilson, Deakin University’s Senior Sustainability Officer. Thirteen aquafil™ water refill stations and drinking fountains have been installed across three Deakin campuses – Geelong Waurn Ponds Campus, Melbourne Burwood Campus and Warrnambool Campus. The initiative, coupled with the ’Be Smart Choose Tap‘ awareness campaign, has helped encourage staff and students to refill their own drink bottles instead of purchasing water in plastic bottles, aligning with the University’s objective to reduce waste to landfill. Melbourne is reputed for having some of the best drinking water in the world, but each year Australians still spend more than $500 million on purchasing bottled water. This means Australians are paying 700 times more per 500ml of bottled water than they would for tap water. Not only are millions of dollars wasted annually on bottled water, the plastic waste that ends up in landfill, waterways and oceans has a severe impact on our environment. Plastic bottles, which take an average estimated time of 450 years to break down, kill our bird and marine life when they mistake them for food. The installation of aquafil™ water refill stations and drinking fountains addresses a key feature in Deakin’s Strategic Plan LIVE the future: Agenda 2020, which provides the opportunity to extend the definition and practice of ‘sustainability’ to include economic, social and environmental concepts.